Developers for Denison’s Gateway Village recently announced plans to construct a new four-story medical office building at the corner of U.S. Highway 75 and FM 691. The new development is expected to bring 80,000 square feet of office space to what has become a medical hub for the city of Denison. The development was first announced earlier this month by Covenant Development President Ryan Johnson during the Denison Development Alliance’s annual economic summit. 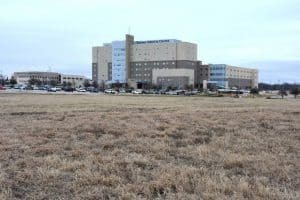 The building will be built on four acres of land directly in front of the main entrance to Texoma Medical Center. 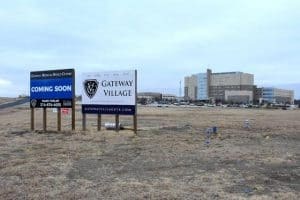 “The purpose of putting a building of this size where it is at is to help prime the pump, so to say, and serve as a showcase for Gateway Village and the medical district,” Johnson said Wednesday. The project will represent a partnership between Covenant Development and Florida-based Sina Companies. In its more than 20 years in business, Sina has developed more than 4 million square feet of medical office space across 20 states with a focus on outpatient treatment. This includes multiple Texas developments in San Antonio, Houston, Nassau Bay and Granbury, Sina Companies Principal Robert Sina said Friday. “We are excited about our latest development in Denison,” he said. With the latest development, Sina said, the facility will be developed to where doctors will have a place to see and treat patients and perform minor procedures. He added that a surgery center could be possible within the building, but it would depend on the tenants that are brought in for the facility. Sina said the number of tenants in the facility will also depend on who decides to rent space in the building. With past developments, Sina said, some larger physician groups could use between 10,000 and 15,000 square feet while an individual physician’s office might be 3,000 square feet. Sina said he has already spoken with several physicians about the opportunity to lease space in the new building, and he expects to start a full-scale marketing campaign in the coming week. As a part of this campaign, he said he plans to target doctors in TMC, which he expects will be the primary users of the facility. “The importance of an office like this is just to get a place where doctors can see their patients,” Sina said. While Johnson said that many of the tenants will likely be affiliated with TMC, he said there are many independent physicians in the community who could make use of the space. News of the new building comes as TMC is expected to open its new tower and emergency room later this spring and other medical-related facilities have either recently opened or announced places for facilities near the hospital. Johnson said a building like this will help focus development in the area toward medical-related facilities and help attract other related interests. With regard to office space, Sina said this new building will represent the first premium office development near the hospital in at least six to seven years. “I think that the hospital is going fantastic, as you can see with the hospital opening its expansion soon,” he said. Sina said construction on the facility is expected to start later this year and will be completed in about 12 months. Click here to read the original article in the Herald Democrat.